The ibis SP Morumbi hotel is 219 yards from the Morumbi and Market Place shopping centers and 984 yards from the U.S. Consulate General. It is 3.1 miles from Congonhas airport, 5 miles from the Transamerica Expo Center and 6.2 miles from the São Paulo Expo. All 376 rooms feature 32" cable TV, air conditioning, minibar, safe and hair dryer. The ibis Kitchen Restaurant serves breakfast, lunch and dinner and the bar, serving food and drinks, is 24/7. The hotel has free WIFI and is strictly non-smoking. 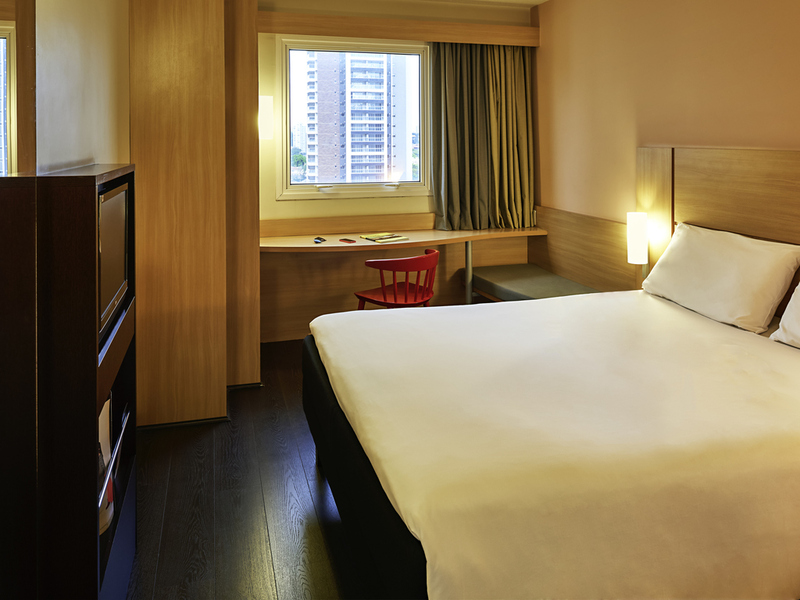 The ibis São Paulo Morumbi hotel, located in the south of São Paulo, is situated near the Morumbi and Market Place shopping centres. Just 5 km from Congonhas airport and 40 km from Guarulhos airport, the hotel benefits from a central location. Nearby attractions include Avenida Paulista, the Atlantic rainforest, Museu do Ipiranga, Memorial da América Latina and Banespa Tower. The in-house A BOA MESA restaurant offers local cuisine. 24-hour bar and free WiFi are also provided for every comfort. Open daily for lunch and dinner, either buffet style or à la carte service. A friendly place to meet at any time of day. The room was clean but had some mold smell, the toilet bowl was loose and leaking. Every time we went to the restaurant we left with smell of fried food (breakfast, lunch, dinner). Nice location, price was a little salty. Bathtoom could be better decorated, projector should have an external hdmi cable. I like the hotel. People were very nice but no one properly explained how all your systems work. I had to guess how to use the elevator, guess how to use the plastic passes at dinner, guess a lot of things. No one tells you in the beginning how everything works. THey assume you know already like you've been here before. Other than that, the food was good and the service was great. Thiago was very helpful. He spoke English and explained most everything to me when no one else did. Exvelente atencion durante la estadia. Door didn't close properly, but room is ok, clean. It was amazing! My check in was very fasy and the recepcionist was friendly and polite! Just loved all the atmosphere and my room was confy and clean. Thanks a lot for everything! The bed and pillows were very uncomfortable. The blanket in the room was dirty. The bathroom was worn and the towels were not very nice. The only positive was the climate control in the room. VERY bad bad internet connection, Just 3/4 elevators were working, on Tuesday it took me 15 minutos to go to first flooor... there was a hole on the wall between my room and the bathroom. THAT WAS GOOD AS EXPECTED UNLESS FOR THE TOWELS WHICH WERE TERRIBLE (TOO OLD TOWELS). I was comfortable and well served. Very pleasant staff. Comfortable clean rooms. Good food. Great location. Nothing out of the ordinary. I was assuming that with the corporate rate breakfast was included (at least that is what it said), I was then informed that was not the case. Excellent food, excellent service. Hamburger is better than Madero's! Bathroom was not great. AC in the bedroom (1157) was too noisy. Great location. My floor was flooded because of a water leak at 3 am!!!! My bedroom was not affected, but smell at the halls was not good at all. Reception telephone was not picked up for 2 hours while trying to confirm my reservation, according to staff during check in it was because they were &quot;too busy&quot;. Room is very small, clean and the &quot;3 layers bed&quot; is not comfortable. Room was quiet but someone in the floor woke up at 5 am, put tv on and made noises for straight one hour (lot of complains but no action taken by staff). Dinner buffet and breakfast buffet are ok.
We stayed at Ibis Morumbi and almost everything was great. The staff, the breakfast and the room was fine. But I don't know why they decided to clean up the corridor's carpet at 6AM! We were very tired of a great trip and had to wakeup with the loud noises of the processes.